In the recent report Students First: Renewing Hope for California’s Future by the Governor’s Committee on Education Excellence ( Nov.2007) the committee notes that California’s students rank 48th. out of the states in 4th. grade reading, 47th. in 4th. grade math, and 43rd. in 4th. grade science. California ranks 48th. in 8th. grade reading, 45th. in 8th. grade math, and 42nd in 8th. grade science. This is not a problem of our unique demographics. California White students rank 29th. in 4th. grade reading when compared to White students in other states, Black students rank 29th. when compared to Black students in other states, and California Latino students rank 43rd. when compared to other Latino students. That is, our schools are in crisis, particularly our schools serving Black, Latino and economically disadvantaged students. And, after 20 years of “school reform,” there has been no real progress. So, what does the Legislature, the Commission on Teacher Credentialing, and the state’s Schools of Education do about this crisis? They create a new video based test for new teachers (TPA or PACT). This new test no relationship to the crisis in school achievement. It will cost over $10 million per year. It does, however, provide career advancement for test writers and professors at Stanford and elsewhere, and keep them from having to work with real teachers in real classrooms to deal with the problems of real schools. Well. The Sacramento Bee has shown itself at its best and at its least insightful in the same edition. Reporters Laurel Rosenhall and Phillip Reese write a valuable article, “Second Change to make grade; schools reclassify students, meet U.S. standards.” It is interesting reading. It shows that schools have approached students to renegotiate their ethnicity in order to pass the requirements of No Child Left Behind. The reporters did their job. They did not, however, explore the closely related issues of how arbitrary cut scores usually lead to this kind of statistical manipulation. That story you will find in the excellent resource: Collateral Damage: How High Stakes Testing Corrupts America’s schools, ( 2007. Nichols and Berliner). The problem is called Campbell’s Law , named for well respected social scientist and philosopher Donald Campbell ( no relation). Campbell’s law applies. Since NCLB, and state laws require using one time tests to measure school achievement, the testing has corrupted the processes of determining who is Black, who is White, who is an English Language Learner. Now conservatives, and poorly informed liberal media, will chuckle and assume that they know better. But, the don’t. And, they will focus on the abnormality of shifting a few kids rather than the more important issue of how high stakes testing corrupts the entire education system by controlling curriculum, underfunding schools, and dozens of closely related issues. These are well laid out in the Nichols and Berliner book. Covering only the reclassification of students, which is important, and not covering how NCLB and high stakes testing produces this and many other corruptions is the media equivalent of Fox news showing the 30 second clips of Rev. Jeremiah Wrights sermons and not showing the 15 minute full sermons. It is out of context and thus distorting. While the Bee reporters did a positive service with their story- even though it has a limited context- the Bee editorial board wrote an essay High Expectations which uses as a foil the incident at Madison Elementary School Principal Jana Fields. Again, what the Principal was doing was seeking to effect the overly simplistic use of test data- to make decisions. She probably handled it poorly. So, the Bee lectures her as if it was obvious that African American kids should not be talked to separately. That is not thinking. Most educators working in the field know of the effort known as The Village Nation- covered on Oprah no less- where African American kids in California were taken aside and talked to straight up by African American faculty about the poor test scores. Educators, including the Superintendent of Public Instruction, praise this case. The Bee editors, however, assume that they know better. This kind of test prep is problematic. A case can be made on both sides. Was it better to have the Sacramento Kings Cheerleaders speak to an integrated audience at Kennedy High. I am certain the kids were looking at these cheerleaders as math mentors not rather attractive young women. In the case of Madison Elementary it probably was a poor idea, in part because very young kids can not sort out the messages. Having one ethnic group, or one gender group meetings and discussions works better with high school students. And it should only be used when there is a proper relationship established for such discussions. But it is not, as opined by the Bee editors, self evident that having a separate meeting to discuss low test scores is always a bad idea. The editors say, “ Yet research consistently shows that what works is high expectations for all students. Focusing on subgroups does not work. “ I know of no research supporting this statement. Please provide it. Yes, there is data for high expectations for all. But, for example, you need to focus on English Language learners- that is a subgroup. And, there is no research that I am aware of showing that- for example- having an all girls math class does not work. I think that you have misstated the case. Old news: Like most other major state programs, California's public universities and colleges are up against devastating budget cuts in the coming year, and probably longer. Those cuts will drive up fees, force larger classes and eliminate courses, services and programs. What hardly anyone is discussing, either among the regents or the trustees – nor was it mentioned at a briefing by the Campaign for College Opportunity last week – is the need to increase state revenues to bring taxes at least to the rates they were in 2003. The governor continues to perpetuate the belief that California's real budgetary problem is excessive spending, not inadequate revenues, a belief that's a core mantra of the state GOP and Grover Norquist's "starve the beast" theology. To do that the governor uses a chart – probably his favorite – showing spending is climbing more steeply than revenues. But as the recent UC "Cuts Report" (universityofcalifornia.edu/senate/ reports/cuts.report.04.08.pdf) points out, "the chart has a number of flaws: is not corrected for inflation, for population growth, for growth in any agency's client base or legal mandate, or for the great variation in growth among different agencies." More important, the chart omits the fact that $6 billion a year – far and away the biggest part of that alleged spending increase – is in fact the result of Schwarzenegger's cut in the vehicle license fee. Because he rolled back that fee by two-thirds, the state has had to backfill to local governments the money the levy would have raised. Were it not for the car tax cut, the state would probably have no need to cut any spending, either for K-12 schools or higher education or anything else. And that's not counting the corporate tax loopholes that the Legislature handed out in the past decade and that, in tax reformer Lenny Goldberg's immortal words, make the tax code like a roach motel: Once the loopholes creep in, they never come out. …But so far, there's still far too much silence from the universities' leaders on the choices: quality schools, colleges and parks in a state to which productive and creative people are attracted, or the no-new-tax mantra and life on the cheap. AUSTIN – Lawmakers who lead the way on education policy are warming to the idea of major changes to Texas' report card system for public schools, which already gets failing marks from superintendents and teachers. A new version, as currently envisioned, would dramatically alter the focus of student testing, which forms the basis for school report cards, and introduce new incentives for schools that make gains. Survey: What would make a better testing system than TAKS? At the same time, educators and lawmakers – not to mention parents – want to see less drilling of students for the annual Texas Assessment of Knowledge and Skills and less severe penalties for schools that have trouble meeting their achievement goals. All in all, dissatisfaction with the current testing-and-rating regimen is building momentum for significant changes when the Legislature next meets in January. "The stick can work, but the carrot works better," said House Public Education Committee Chairman Rob Eissler, co-chairman of the committee that is considering revisions of the accountability system. "Our system should be recognizing and rewarding the best schools and helping repair those that are low performing," said Mr. Eissler, a Republican from The Woodlands. The current system annually grades every school and district in the state based on their TAKS scores and student dropout rates. Schools are graded exemplary, recognized, acceptable or unacceptable. Superintendents, school boards, teachers and parents anxiously await the performance ratings each year, as they represent the chief measure of how well schools are doing in educating their students. Parents and real estate agents typically use the evaluations to locate neighborhoods with the best schools. Increasingly, though, educators and parents have voiced dissatisfaction with the grading system, arguing that the massive changes in education since the system was first implemented in 1994 have made it obsolete. Among those changes are increased federal attention and a stronger state curriculum. "It fails to address the individual needs of students," said Plano Senior High School science teacher Karen Shepherd. "It looks at students en masse as numbers, not as individuals." Ms. Shepherd, who was the state's 2005 secondary school teacher of the year, said teachers want a system that is diagnostic instead of punitive. "It needs to determine where students start and look at their growth over a year instead of expecting them all to meet a certain level of proficiency" on a single test, she said. "I know as a person I don't like being judged on one action, and I would never look at my students on just one day," she said. Senate Education Committee Chairwoman Florence Shapiro, R-Plano, agrees. She would like to see a major shift in the testing program so that it focuses on academic growth of students over the school year rather than requiring them to meet minimum standards, as the state now does with the TAKS. Acceptable performance ratings for schools are based on a minimum percentage of all students at each campus passing the exam in the spring, along with a certain share of various student subgroups. For example, schools last year had to have 65 percent of their students pass in reading and 45 percent pass in math to be graded "acceptable." "We need to look at a system that shows the progress of youngsters over a school year and not base everything on a one-shot test," said Ms. Shapiro, who leads the Select Committee on Public School Accountability with Mr. Eissler. One way to do that, she said, is to measure the improvement in skills from one year's TAKS to the next. If students at a particular campus registered enough improvement over a year's time, it would result in an acceptable rating. If the average improvement in test scores was good enough, it would bring the school a higher rating. Ms. Shapiro said many lawmakers also want more concentration on how to improve low-performing schools and less focus on punishing failure. Incentives could include expanding the state's merit-pay plans or giving schools more flexibility on state requirements. Another reason to revamp the accountability system is the new testing program that will be launched in high schools in the 2011-12 school year. Beginning with ninth-graders that year, students will be required to take a dozen end-of-course exams through high school and get a passing score in each subject area to earn a diploma. Inadequate testing. Imagine that. Perhaps someone could get the attention of California legislators. Texas was a leader in getting us into this testing mess. Perhaps they can lead the way out. See : Collateral Damage: How High Stakes Testing Corrupts America's Schools. 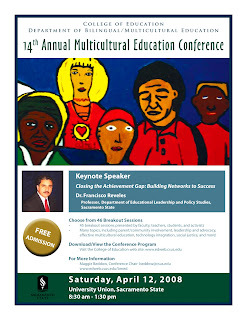 Dr. Francisco Reveles will be the keynote speaker at the annual Multicultural Education Conference sponsored by the department of Bilingual/Multicultural Education on April 12, 2008, in the university union of the Sacramento State Campus. Dr. Reveles is a Professor in Educational Leadership and Policy Studies and a graduate of bilingual programs here at CSUS. He is considering a run for State Superintendent of Public Instruction. Over 45 workshops will offer ideas on teaching strategies, test taking, the current crisis in education budgets, and more. Dr. Reveles is a Professor in Educational Leadership and Policy Studies and a graduate of bilingual programs at CSUS. Over 45 workshops will offer ideas on teaching strategies, test taking, the current crisis in education budgets, and more. More to the point, the state’s current proposed budget cuts to education are still another example of simplistic political thinking that does nothing to address the needs of our growing diverse student population, according to Reveles. “Tragically, we are now facing cuts of 4.1 billion in K-12 education and $386 million in the CSU system,” he said. “Public schools that have been working hard to make lasting gains in achievement and retain committed teachers and counselors will see their efforts further eroded. School administrators, already struggling with the unpredictability of year-to-year funding cycles will see an increase in class size along with teacher layoffs." The CSU system will also suffer as unfunded mandates relating to teacher education are enforced and tuition increases are implemented. Clearly, we are at a crossroads in education, observes Reveles. Obama campaign and antiwar work. So, if you live in Pennsylvania or Indiana, where there will soon be a primary, you will need to make electoral choices. And the California D.P. caucuses are next week. But, the active campaign season only lasts a few weeks in each state. After the primary- and in the other states- we should be educating, agitating and organizing. Our task is to advance an anti war and an anti imperialist view as far as we can, to build the anti war movement. Two or more of the DSA Honorary Chairs have signed on along with an impressive list of leftists. Also, on the same page, is a good guide to independent, ie. not Democratic Party, participation in an electoral season by Carl Davidson. BTW. the effort of Progressives for Obama is not to accept the Obama campaign as it is- but to organize and to push it left, specifically on the war. An alternative approach has been that of PDA which has done some good work within the D.P. And, United for Peace and Justice has a strategy for anti war work in this electoral season. So, there is more than enough to do. We need to move beyond the limited paralysis of punditry and make what we can of this electoral season. Barack Obama on Teacher Preparation ? A friend of mine mentioned that Linda Darling-Hammond of Stanford was serving as an educational advisor for Barack Obama. The New Republic posted this. Prepare Teachers: Obama will require all schools of education to be accredited. He will also create a voluntary national performance assessment so we can be sure that every new educator is trained and ready to walk into the classroom and start teaching effectively. Obama will also create Teacher Residency Programs that will supply 30,000 exceptionally well-prepared recruits to high-need schools. SB 2042, in 2000, required a major revision of teacher preparation in California based upon a new set of state standards and a set of teacher performance expectations (TPEs). The universities have responded by revising their programs. In 2042 the legislature created a system where the state must continually train new teachers to replace those driven out by inadequate working conditions. One element of 2042 required the development of high stakes performance assessment of California teachers (TPA) based upon the teacher performance expectations (TPE) to be developed by the Commission on Teacher Credentialing. The problems with this are several. There is no evidence that TPA’s are valid measures of good teaching. To the contrary, our experience tells us that one-time all-or-nothing tests like the TPA are among the poorest possible ways to predict the likelihood that a test-taker will be an excellent California teacher. Thus the California legislature and CTC have imposed an expensive, redundant accountability system – one the state cannot afford in its current budget crisis. It would be a gross injustice to add funding for this performance assessment into the budget when our schools are having to increase class sizes, lay off teachers, reduce career technical education, cancel transportation, and delay long needed school reforms. So, I wonder if this is the kind of performance assessment Barack Obama is in favor of?